A new deal means Glasgow City Council can begin paying back thousands of underpaid workers by selling off some of its most iconic buildings and venues to a council-run body and leasing them back to help pay for an equal pay settlement. Council leader Susan Aitken had plans to remortgage several building approved yesterday in a move that will raise the majority of the £548m needed to payback thousands of staff who were underpaid for decades. The move means the city will shoulder payments of at least £25m for decades to come. 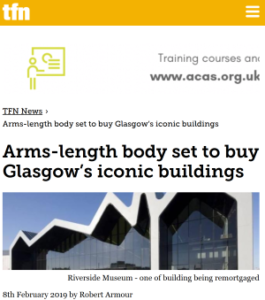 City Property, one of Glasgow’s eight arms-length external organisation (Aleo), will take over the buildings and venues although details have yet to emerge. Many of the city’s Aleos are also charities, however City Property isn’t. The equal pay agreement begins a process expected to see workers receive details of their individual entitlements over the next few months and compensation paid from this summer.